Using your own two eyes. I see articles all the time about how important night vision devices are and I agree. The problem for most of us is the cost to get a really good set. Plus there are always problems with breakage and batteries. So what happens when they break or are just not available? You can increase your natural ability to see at night by applying the following four principals of night vision. 1. Dark adaptation: Before going outside at night, keep out of all light for at least one half hour. This will let your eyes become accustomed to the dark. A half a second’s exposure to light will destroy your night vision for minutes. If it is necessary to check your equipment or map use a red light bulb or keep one eye closed. 2. Scanning: You cannot scan an area at night like you scan during the day. At night, you move your eyes in short, jerky, abrupt movements over the area until you locate an objective. Then you use off-center vision to observe the object. 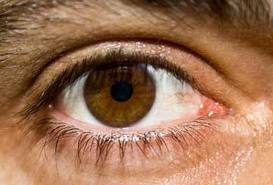 Move your eyes in short jerky movements over and around the object, while concentrating your attention on the object. 3: Off-center vision: If you focus a little to one side of an object you can see it more clearly than if you look directly at it. This is especially true at night. 4: Confidence: Confidence is fully as important as dark-adaptation, off-center vision and scanning. You usually use your eyes where there is plenty of light, so your brain is used to images of sharp outlines and bright colors. In the darkness, your brain receives images that are faint, have no sharp outlines and little or no color. You must have confidence to believe what your eyes tell you. This confidence comes from practicing and using the principles of night vision. In his 1996 book Bravo Two Zero about the first Iraq war a British SAS soldier named Andy McNabb described how they infiltrated behind enemy lines. Mr McNabb explains that they travelled at night to avoid capture using only their own eyes to navigate. He says that none of the Special Forces soldiers took electronic night vision goggles, as they were too heavy and clumsy to carry around. After years of training at night, their own night-vision was almost as good. The one serious problem that they encountered was that once you see a bright light, your eyes reacts and your eyes return to normal daylight vision again. To combat this he read his maps with one eye closed so that only one eye would lose night-vision. Some suggestions for beginning preppers. This entry was posted in Operational Secrecy, self defense, Self sufficiency, survival and tagged eyes, Howard, night vision. Bookmark the permalink. Night vision both with and without devices must be pratciced now. It doesnt take alot of fancy stuff or a special place it just takes getting off the the x when you are most comfortable and doing it. When we hunt we normally go in an hour or 2 early and settle in and we never use aids and very rarley use lights. Like the SAS said close one eye anytime a bright light is encountered like a vehicle, cigarette being lit, reading a map or a perimeter flare being set off. NVGs also have a downfall that must be learned and that is depth perception. You see shadows of things like ditches but dont know if its 2ft or 20 ft deep and sometimes in CQC or even just walking around i have run into things i thought were further out. Make sure when you practice this stuff you wear glasses because more than one tree branch hasd found its way into someones eye. People underestimate the ability of the human eye to adapt to low light conditions. If you practice this a bit you can get good. Remember night vision gear has only been around a short time. For the rest of human history we used our own night vision. The book by “Andy MacNab” was talking about OLD gen 1 night vision that was heavier and far less useful then modern versions. While I agree that often your own night vision is adequate, modern gen 2+ and gen 3 night vision is a drastic improvement over the original goggles. PVS-14 style (very common for both civilian purchase and military use), are a monocular that goes over one eye, and has a gain adjustment. 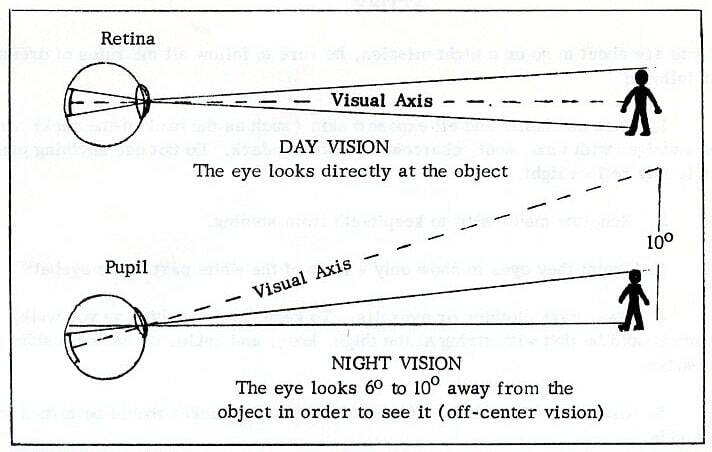 In this way you have one eye with full night vision, and the other is adjusted to the dark. Your eyes (if adjusted properly) will appear to be looking through the night vision, however if you turn down the gain correctly your other night adjusted eye provides for an acceptable amount of depth perception. As with anything else, there is a learning curve to the use of night vision- if you are going to spend the money- take the time to practice, not just once, but an hour or so a night for at least a week. I’m in my 70’s and for the past 15 years I have camped specifically to stay awake at night doing normal camping things and sleep for a while during the day. I think doing so teaches us and highlights our limitations and allows us to overcome some of the limits of dealing with darkness. The limits become obvious and doing so provides us opportunities to practice adapting. We’ve already seen lots of daylight. Practice living in the dark. Two points: Where an eye patch. The longer you wear it the better the night vision effect. Put it on in the morning, wear it all day and don’t take it off until full dark. You will be amazed at the night vision you will have. Do not look at a campfire or any light you will lose the night vision instantly. 2. tape or tie a glow stick to a 2″ long stick or dowel. After dark activate the glow stick and keep it just in front of you by six inches or so and about mid shin high. You can walk through the woods and not miss a step or lose footing. That little glow stick less then 12″ off the ground will really light up the path and it will not be too bright for your eyes. One hint for walking at night n the woods: wear safety glasses and a brimless hat. A brim will often prevent you from seeing a branch but the hat will minimize the effect a branch has if you do walk into it. Damn. That’s “wear” an eyepatch. And that was a 2 foot long stick or dowel. Pirates wore an eye-patch because they used a sextant to take the noon Sun shot reading. It is how you determine longitude. As the process involved holding the sight on the sun as it reached its apex point each day; eventually, the man/navigator would literally burn out his eye. Thus, the eye-patch. When a sailor ‘achieved’ the eye-patch, he normally retired from all navigational tasks. agree with Matt above, you need to train with your NV equipment. recently took 6 day course that involved night exercises. some had NVG that they had used and trained with before. all said there was a definite learning curve. yes it helps. also look a FLIR, that technology is a real eye opener (pun intended), and can be used in daylight as well as a night. very simple to use, downside is cost of course. to Bob, yes you can use IR illumination, but if your opponent has NV capability, its like you just sent up a flare, turned on a spotlight, might as well turn on the radio for tunes, get comfortable, just before something bad comes your way. if you train w/o the above, remember to protect your eyes with some clear eyewear. branches have a strong tendency to hit you in the face, especially if you dont see them. like a smart man once said, if you have a safe full of firearms, sell some and use the proceeds to get the above equipment, after all, generally every day consists of a good number of hours without light, and more than likely most bad things that go ‘bump’ occur in the dark.